E-Government research and practice has changed over the years to incorporate recent and contemporary technology developments and unique in evolving contextual environments. Further, the emerging conceptualization of service and applications interactions is slowly defining the gamut of e-Government research and practice. On another front, there has been a dynamic transition of e-Government being implemented on Web3.0 from the original Web2.0 platforms and advanced e-Government applications accessible on mobile devices i.e. ubiquitous or mobile government. Web3.0 presents a semantic platform allowing responsive man-machine interfaces and applications integration facilitating advanced information management possibilities. 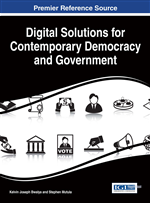 The chapter explores the contemporary issues in e-Government and articulates the pertinent factors that need to be interrogated for successful and sustainable e-Government development. Key questions of e-Government and the design principles that need to be taken into consideration in any e-Government project are explored. E-Government, the use of Information and Communication Technologies (ICTs) in public service delivery platforms, is being implemented in many countries as a lever towards improved efficiencies, effectiveness and reduced cost in delivering public services. E-Government is a multi-dimensional concept which presents itself as a complex phenomenon to realize regardless of the context in which it is implemented. Complexity of e-Government has culminated into many e-Government projects to fail (Heeks, 2003; Andersen & Henriksen, 2006; Wimmer, Scholl, Grönlund, & Andersen, 2006). With the ever-changing technology trends, sustainable e-Government implementation demands that the e-Government technology platforms constantly evolve and adapt the emerging technology trends. Therefore, technology being one of the main enablers of e-Government calls for open and scalable interfaces which can continuously be scaled and adapted to the emerging trends. The role of technology in providing requisite Man-Machine interfaces and process/application integration for easy and sustainable access to government information cannot be overemphasized . Models and frameworks in e-Government have been proposed by a variety of researchers (Kamal & Themistocleous, 2006; Titah & Barki, 2006; Lin, Fofanah & Liang, 2011). Because of contextual differences in the areas in which e-Government is implemented, the different contextual frameworks and models are not global and therefore are not a model-fit as-is in any given area. And because of the multi-dimensionality nature of e-Government, there is need for multi-dimensional model for e-Government development and assessment. Many researchers have been very active in investigating e-Government although there is currently no global framework or model to guide e-Government research and practice. The lack of global conceptual frameworks and models has been compounded by e-Government research with low predictive and explanatory power. The results of such research have been rendered invalid and unreliable (Al-Hujra, Al-dalahmeh,& Aloudat, 2011). Further, it has been alluded that there is generally a mismatch between practice and research and that there is generally lack of agreed-upon (or standard) sets of e-Government taxonomies. Given the aforementioned discrepancies between practice and research of e-Government and the key issues brought about by its multi-dimensionality and the differing contextual setups in which e-Government is implemented, it is vital to have robust and grounded research investigating each of the key issues in e-Government. Therefore, this lead chapter intends to bring out the key issues in e-Government research and practice and bring out the current and future research themes for sustainable and robust e-Government design and implementation. The chapter is arranged into different themes which intend to address each of them as succinct as possible. The themes are chosen in such a way that they cover what e-Government is, the challenges to implementing e-Government in diverse contextual setups, the role of technology as one of the key enablers of e-Government, the e-Government research themes and focus, applications and semantic interoperability, the need for the design of responsive and adaptive e-Government systems, and a discussion on the future trends of e-Government research and practice. Although it is cognizant that there are several critical factors influencing e-Government, this lead chapter is biased towards focussing on technology as one of the main enablers of e-Government development.